Academic Achievement Awards – After a review of our current prize lists we plan to introduce trophies and prizes for pupils who show outstanding achievement in the areas of Mathematics, Science, Technology and Geography. These would be presented to pupils as part of the annual prizegiving ceremony in June. If any individual, organisation or business is interested in sponsoring a particular subject award then they are invited to contact John Port, Headteacher, to discuss the options. The cost of trophies and any associated prize is not normally burdensome and we are grateful to several groups and individuals in the community who currently contribute towards recognising the success of our youngsters. The Headteacher can be contacted by telephoning 712275, by letter or email (gairloch.high@highland.gov.uk). 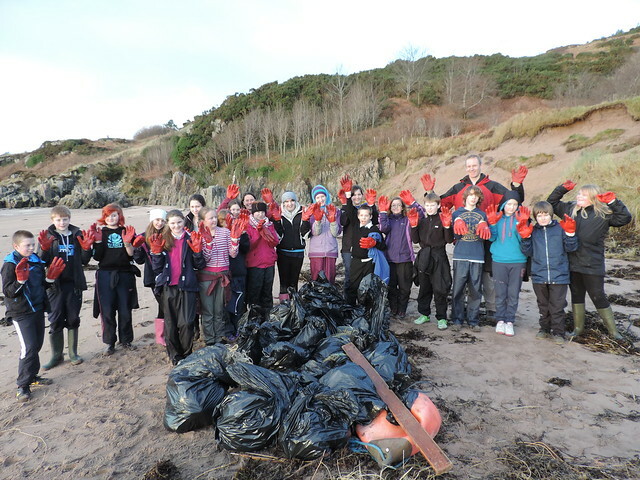 Beach Clean – Our S1 pupils have been down at the beach next to the golf course in Gairloch trying to clean up after the recent storms. The dunes have been damaged extensively but of more concern is the amount of plastic washed up amongst the seaweed. S1 pupils spent an hour or two filling bags that were later collected by the local Council Refuse Collectors. The pupils did this as part of their S1 Activity course called SMART, part of which contributes to their achieving the John Muir Discovery Award. The award supports pupils taking responsibility and forming an understanding of their local environment. Basketball Result – The senior boys played Alness Academy on Thursday 16th January, in the first game of the new Highland Schools’ League. In a tough encounter, the score was even at half time. Despite good rebounding and defence, we couldn’t keep out their biggest player and the full time score was 54 – 65 to Alness. This is our best ever result against this team. Event Management and Hospitality – The S5/6 Hospitality Class planned and prepared food for the Torridon Mountain Rescue Team training weekend at Badaguish (Friday 10th to Sunday 12th January). Working to a budget, the group planned all the meals for fourteen people over an active weekend, bought and prepared the food, and packed it ready to go. The menu included cooked breakfasts, lots of choice for packed lunches, and dinner on Saturday night was cottage pie and apple crumble. All the MRT members had to do was stick it in the oven! The food was delicious, and there was lots of it. The S3 group also baked a mountain of tray bakes so there was no risk of going hungry between meals. All the team was very impressed by the food and sends thanks to the pupils and Miss Thistlewaite for their hard work. Former Pupil Success – Emma Felber, daughter of Katherine Vine, received her Doctorate from London University on 17th December 2013. Emma’s thesis was entitled ‘Memory, mobility and social change in a Bolivian town’, and it was done at the anthropology department at Goldsmiths College. Emma says that it is about what happens when rural places are abandoned and people who have moved to the city remember them nostalgically. She notes that growing up in Wester Ross inspired her work. Emma’s brother Crispin Struthers has been nominated for an Oscar for editing American Hustle. He was nominated last year for his work on Silver Linings Playbook. 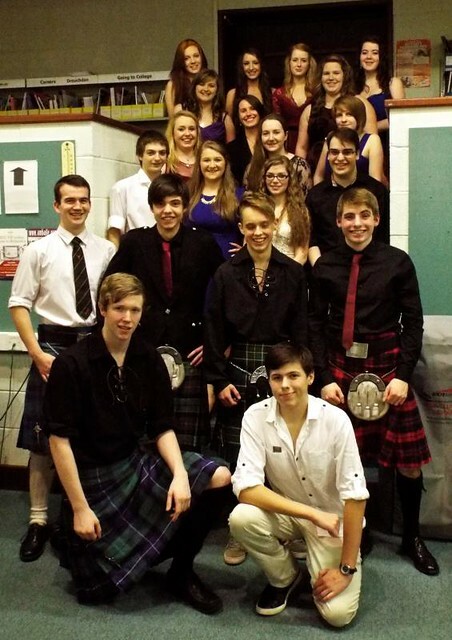 Read about some of our former pupils here. Important Dates – Available on the school website here. All pupils on holiday during the week Monday 17th to Friday 21st February. Staff INSET will take place during Wednesday, Thursday and Friday of that week. Best wishes for the New Year from everyone at the school – As we enter 2014 it’s back to work with a vengeance. Prelims for S4/5/6 pupils begin on the Tuesday 14th January. After-school study clubs have already taken place first week back. S2 parents have been invited to the school on the evening of the 14th January to discuss course choices in preparation for their sons and daughters entering S3 next session. The relevant paperwork was sent home before Christmas and is available here on the school website. At assembly before the Christmas holiday the following pupils were awarded the Duke of Edinburgh’s Award: Silver – Siobhan Vickerstaff, Bronze – Freya Baptist, Charlie Bulmer, Alfie Gudgeon, Joseph Smith, Calum Nelson and Matthew MacLean. Well done to each of them for putting in the effort and commitment required to achieve this prestigious award! The School Christmas Dance was a great success with music, food and dancing right up to 11pm and beyond. 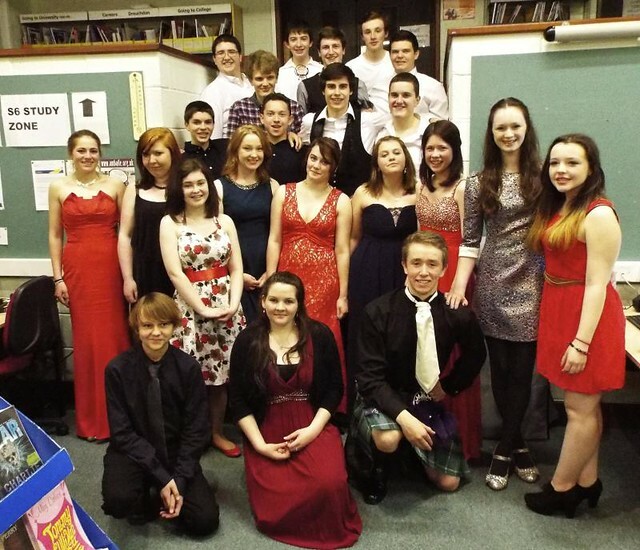 Thanks go to everyone who helps make this fabulous occasion possible – the list is long but the pupils appreciate it. Office staff sell tickets and manage the finance. Mrs. Fraser and Mrs. Mackenzie, along with others too numerous to mention, who purchase and prepare the half-time banquet. On the night this group of staff spend the first half of the evening in the school preparing the food while the pupils dance to the music. Trish and Bruce provided the music this year and it was VERY well received by all. Prior to the dance Mrs. Johnston and other staff helped teach and reinforce social dance skills allowing S1 to S6 pupils to participate comfortably with reels, waltzes and jigs. Our piping tutor, Mr. Gary Nimmo and the newly formed pipe band provided a rousingly traditional opening. We are greatly appreciative of the continued support of the local garage for laying on transport to and from the dance along with additional minibus driving this year from Mr. Bowker and Dr Shearer. 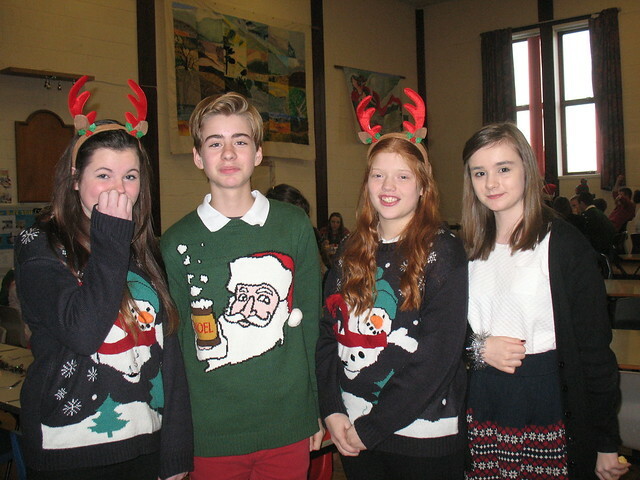 Photographs of this event and others can be viewed on the school website by clicking here. 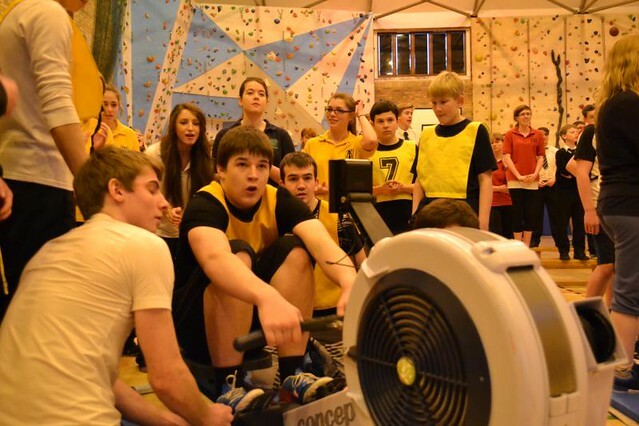 Krypton Factor, Indoor Rowing & School Quiz – We like to end the term with a variety of activities that are important educationally yet encourage a sense of community and challenge. Thanks to Mr. Hulme and Dr Caley the school quiz provides a challenge that all pupils can take part in! Pupils are mixed into House Teams and compete for House points. Impressively this year the quiz continued through a power cut and much fun was had trying to attempt the picture rounds in the looming darkness of a December afternoon! The pupils also took part in an Inter-House indoor rowing competition organised by Mrs. Johnston and her Activity Tourism pupils. House points could be gained either as part of a team event or by taking part in an individual rowing challenge. Nearly every pupil in the school attempted a personal challenge. Well done all! Finally Mr. Johnston with help from many staff organized a Krypton Factor Challenge. Pupils, again in House Teams, took part in Mental Arithmetic, Mental Agility, Observation and Listening, Strength, Endurance & Sports’ Skills. All had good fun and we hope that pupils get to know each other a little better by taking part in events that are a bit different from the norm. Previously on the evening of Tuesday 10th December a large number of parents and other members of the community turned out to hear our S5 and S6 pupils talk about their recent trips abroad. The 10 pupils that went to Malawi each spoke for around 5 minutes describing different aspects of the trip. After a refreshment break that included a range of Scottish, Malawian and Latvian cake and sweets, Innis Taylor and Becky Griggs gave a presentation about their recent trip to Latvia. It was an enjoyable evening that showed the benefits of opportunities offered to pupils. Thanks must be given to all the staff involved in supporting the pupils throughout! On Wednesday 11th December we had our annual Christmas Lunch prepared by Mrs Libby McLean and her canteen staff. This year the Prefects suggested a Christmas dress code. They purchased Christmas Crackers and took donations form staff and pupils. As a result the school donated £80 to the Salvation Army in Inverness! Well done to the pupils for taking the initiative and introducing an enjoyable and worthy variation that is likely to be repeated next year. Before Christmas parents of S1 and S2 pupils were sent information regarding changes to our curriculum structures that will be implemented next session. This has a bearing on planning taking place for course choice for pupils in S2 about to enter the third year of their Broad General Education. The attached information is a copy of the information sent to all those with children in S1 and S2. We have discussed these changes with the Parent Council and asked pupils throughout the school to give their views on the changes. Enclosed (click here) is the current version of the plan with some explanatory notes. We believe this is the best solution for our pupils within existing resources that meets the requirements of the steer produced by Highland Council. These changes will be implemented with the next timetable which starts in May for current S2 pupils. If your son or daughter is in S1 just now they will come into effect when they enter S3. Parents of S2 are invited to a meeting with the Senior Management Team and Pupil Support on Tuesday 14th January 2014 at 7pm. If any parent of S1 wishes to discuss the details I would suggest they attend the next Parent Council Meeting or arrange to see me at the school.